Worn together or separately, the Harken Hyperseal™ Pro 3-Layer Semi-Drytop and Bibs provide professional-level protection from the elements while offering a level of comfort and convenience uncommon to foul weather gear. The Hyperseal Pro Semi-Drytop is crafted with details you'll love like an anti-fog/anti-UV wrist window for checking your watch and a tricot lining for comfort against bare skin. Harken's innovative Hyperseal™ collar features soft, non-chafing Lycra and high-stretch neoprene for a nearly watertight seal against your skin. 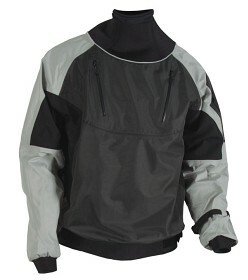 The 3-layer fabric (Teflon coating, polyurethane membrane, and tricot) is 100% windproof and waterproof but has superior mobility and breathability. Hyperseal™ Pro gear even helps you get around the boat more efficiently with features like neoprene anchors in the waistband to prevent ride-up, reinforced abrasion-resistant panels in high-wear areas, and 2-way stretch material on the elbows, back, and underarms.